Philippine hotels and resorts reservation request. Fill up reservation form link. Our reservation agent will contact you within 4-8 hours during office hours. 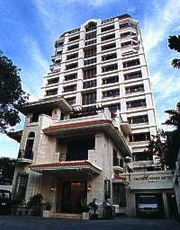 Manila travel agents, Manila hotels and resorts reservation services provided by Philippines travel agents, Philippine tour operators. Discount rates are not applicable to walk-in guests at the hotel / resort counter. 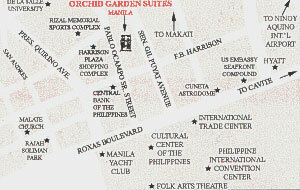 The Orchid Garden Suites is ideally located amid shopping centers, parks, museums and restaurants. It is a pleasant stroll from scenic Manila Bay, the Philippine International Convention and Trade Centers, the Cultural Center of the Philippines, the Metropolitan Museum of Manila, the Manila Zoo, and the Rizal Sports Complex.